Complete full collection of Twenty-seven wood vases for Chinese artificial flowers by Ettore Sottsass, Edited by Design Gallery Milano, 1995. Laminated wood, metal and glass. Limited edition of 12 pieces per model, all stamped and brass signed. In good original condition, with minor wear consistent with age and use, preserving a beautiful patina. Complete full collection. Extremelly Rare to find all together. Only one small red glass from vase 's' is missing. Several different meassurements. Each one is different. Ettore Sottsass (14 September 1917-31 December 2007) was an Italian architect and designer of the late 20th century. His body of designs included furniture, jewelry, glass, lighting and office machine design. 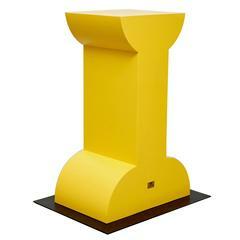 Sottsass was born on 14 September 1917 in Innsbruck, Austria, and grew up in Milan, where his father was an architect. In 1956, Ettore Sottsass began working as a design consultant for Olivetti, designing office equipment, typewriters and furniture. Sottsass was hired by Adriano Olivetti, the founder, to work alongside his son, Roberto. There Sottsass made his name as a designer who, through color, form and styling, managed to bring office equipment into the realm of popular culture. Sottsass, Mario Tchou, and Roberto Olivetti won the prestigious 1960 Compasso d’Oro with the Elea 9003, the first Italian mainframe computer. In 1968, the Royal College of Art in London granted Sottsass an honorary doctoral degree. Whilst the Memphis movement in the 1980s attracted attention worldwide for its energy and flamboyance, Ettore Sottsass began assembling a major design consultancy which he named Sottsass Associati. The studio was established in 1980 and gave the possibility to build architecture on a substantial scale as well as to design for large international industries. Sottsass Associati, primarily an architectural practice, also designed elaborate stores and showrooms for Esprit, identities for Alessi, exhibitions, interiors, consumer electronics in Japan and furniture of all kinds. The studio was based on the cultural guidance of Ettore Sottsass and the work conducted by its many young associates, who often left to open their own studios. Sottsass Associati is now based in London and Milan and continue to sustain the work, philosophy and culture of the studio. An architect, industrial designer, philosopher and provocateur, Ettore Sottsass led a revolution in the aesthetics and technology of modern design in the late 20th century. Sottsass was the oldest member of the Memphis Group — a design collective, formed in Milan in 1980, whose irreverent, spirited members included Alessandro Mendini, Michele de Lucchi, Michael Graves, and Shiro Kuramata. All had grown disillusioned by the staid, black-and-brown “corporatized” modernism that had become endemic in the 1970s. Memphis (the name stemmed from the title of a Bob Dylan song) countered with bold, brash, colorful, yet quirkily minimal designs for furniture, glassware, ceramics and metalwork. They mocked high-status by building furniture with inexpensive materials such as plastic laminates, decorated to resemble exotic finishes such as animal skins. Their work was both functional and — as intended — shocking. Sottsass's most-recognized designs appeared in the first Memphis collection, issued in 1981— notably the multihued, angular “Carlton” room divider and “Casablanca” bookcase. As pieces on these pages demonstrate, however, Sottsass is at his most imaginative and expressive in smaller, secondary furnishings such as lamps and chandeliers, and in table pieces and glassware that have playful and sculptural qualities. It was as an artist that Ettore Sottsass was celebrated in his life, in exhibitions at the Los Angeles County Museum of Art, in 2006, and the Philadelphia Museum of Art a year later. Even then Sottsass’s work prompted critical debate. And for a man whose greatest pleasure was in astonishing, delighting and ruffling feathers, perhaps there was no greater accolade. That the work remains so revolutionary and bold — that it breaks with convention so sharply it will never be considered mainstream — is a testament to his genius. 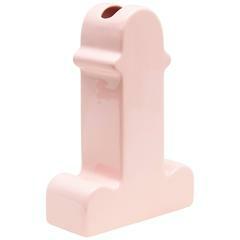 Italy: Ettore Sottsass vase from Yanta Series, Model Y15; Bitossi for Design Centre, 1968.